Ubiquitous – they really are everywhere! Whether you go to the supermarket or a mini-mart, a major retailer or a quaint boutique, a big box home improvement store or a neighborhood hardware store, chances are you’ll walk away with several plastic bags. One billion – – that’s the number of plastic bags handed to consumers every year in the US. Single Use – they are used for a few minutes and then thrown away. that plastic bags are made from oil – a non-renewable resource? 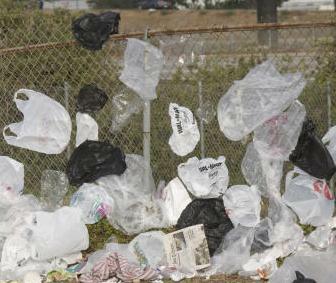 that in the US, 12 Million barrels of oil is used to supply 100 Billion plastic bags annually? that both paper and plastic bags require lots of resources and energy to produce? that less than 4% of plastic bags are recycled? that recycling plastic or paper bags is not simple or easy? that there are between 500 Billion and 1 Trillion plastic bags in circulation annually? that plastic is forever? Plastic never breaks down in the environment – it just gets reduced to plastic dust? that about 100,000 dolphins, turtles, whales and penguins are killed each year due to ingesting plastic bags? that plastics bags have been found floating north of the arctic circle? Using cloth bags can save anywhere from 25,000 to 50,000 plastic bags in a lifetime. Try and vis ualize what 50,000 bags looks like in a landfill- pretty gross! 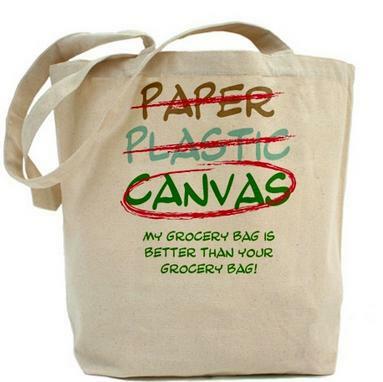 Reusable shopping bags reduces emissions, petroleum usage and waste. During its four year ban on plastic bags, China reports saving over 4.8 million tons of oil (the equivalent of 6.8 million tons of standard coal), not to mention 800,000 ton of plastic . Several cities in the US and a number of cities in England, Italy, Mexico, Australia and India have enacted similar bans. Reusable bags just makes sense. The Best thing is that it’s Really Easy! All you have to do is buy some inexpensive reusable bags from the grocery store, keep them in your car, and remember to use them. It gets lots easier with a little practice. (Remember to throw the bag in the washer after transporting raw meat or fish). And when you get good at the grocery store bags, buy a small, lightweight, fold-able bag (some even come attached to a little pouch that the bag folds into) that you can keep in your purse for trips to the mall or spur of the moment purchases. You’re going to feel great! You’ll feel a real sense of accomplishment every time you reach for that reusable bag instead of a plastic bag. You’ll feel great for yourself, for your planet – and especially for the generations who will come after you. Tags: Artic Circle, canvas bags, embrace the planet, harm to wildlife, landfills, non-renewable, oil, paper bags, plastic bags, recycle | Permalink. Thank you for this blog. As a country, we must decrease the use of plastic bags for the preservation of our land and health. As DNP (Doctor of Nurse Practice) students, a couple of my colleagues and I are presenting a recommendation to our local policy makers (3 different cities in Texas) to institute a consumer use fee for plastic bags. I would like your permission to use your “Did You Know” section in the talking points we are creating. We will credit the use with your name and the blog site.